The results have arrived for the students who sat the Cambridge English tests in December. Thanks to the students’ hard work and the dedication of our teachers BBELS has received some fantastic results. We would firstly like to congratulate Zora Naef for her excellent result in the Cambridge Proficiency Exam. Zora’s Use of English, Reading and Writing tests were graded as “Exceptional” Well done Zora! Secondly we would like to congratulate the students in our Cambridge Advanced classes. There were some very high results including Gijs Propper and Caterina Schumacher who both received an “A” as their final grade. Congratulations should also go to the 5 other students who recived a “B” and the 14 students who received a “C” grade. Finally a big congratulations to the students in the First Certificate Classes with 8 students receiving a “B” and 7 students receiving a final grade of “C”. These students managed to study hard throughout the day and enjoy Byron Bay’s natural environment and relaxed lifestyle after class. We hope that their certificates help them in their future careers and educational pursuits. Meet the BBELS Staff: Marcos Supioni, marketing. This month we had a chat with Marcos, from our marketing department. Marcos is the marketing manager for countries such as Brazil, Portugal, Saudi Arabia, Kuwait and the Arab Emirates. He is just about to finish his Masters in Consumer’s Behaviour, and as he pointed out, he began his amazing journey in Australia as a student at BBELS! What is your role as the Marketing Manager? I’m part of the marketing team at BBELS. I am the Marketing Manager responsible for promoting BBELS quality programmes to Portuguese and Arabic speaking countries. That means I look after the students and agents from these countries, from the initial contact till the students last day in our school. I use my experience as a former BBELS student to help others students have a great time here in Byron Bay. I’m also responsible for sales, social media and developing new partnerships with the countries I mentioned. I started working here in 2014. But I have been connected to BBELS since 2010, when I was a student and had my life completely changed (for better, of course!). Why did you decide coming to BBELS? I decided to come to BBELS after extensively researching English schools in Australia. BBELS was the one that suited me best. I was tired of studying English in schools in Brazil and not learning properly. So I decided to find a school where I could develop my English skills in a beautiful locality. I used to live in a big city (São Paulo), and I needed a break from the traffic jams and from the hustle and bustle of that place. So, BBELS was perfect, because here I found everything I was expecting from an exchange course: academic quality and a beautiful place to relax and have a good time. The culture exchange between the students! Because we have such a big diversity of different nationalities (an internal year to date research shows 23 different nationalities studying at BBELS), there’s always something to learn from my experience with students from different cultures. I also love the fact that BBELS is not a school chain. Unfortunately there is a trend in the education industry where schools are compromising their teaching quality in order to make more profits. They increase in student numbers, became chains, and they drop the quality and commitment with their students. This is not the case at BBELS. BBELS is owned by a long-term local family who is passionate about teaching and they really take care of their staff and students. So here we are like a big family. This produces a very good working environment. … Be like a sponge! Soak up the amazing atmosphere at school and absorb the cultural differences. When you are living in another country, surround yourself with friends and interesting people, and you’ll absorb their positivity and this will enhance your experience! Meet the students: Francisco from Chile. This month we are proud to introduce you to Francisco. Francisco is from Santiago, in Chile, and he has some nice tips to share with those who want to come to BBELS. How long have you been studying at BBELS? I studied in BBELS for 6 months. At the beginning my English skills were a disaster, however after the first month I started to improve more and more. My first class was “Intermediate” and when I completed that level I moved to the “IELTS” class. I think it was a perfect decision because during my last month in Australia I decided to take the IELTS exam and to be honest I am really happy with the score that I got. The BBELS staff is just amazing. They are always dedicated to students’ needs and one of the things that I always remember from my first day in the school is their effort to learn the name of every student before they arrive and that is something I appreciated a lot. The school is situated in a beautiful building and the teachers are excellent. Nevertheless, the feature that I like more about BBELS is the possibility to meet people from different countries, make friends and know new cultures. Overall, all knowledge acquired there is going to be useful for life. I printed some resumes as soon as I arrived in Byron and I left it in every shop that I was interested in. Furthermore, I got some jobs through the Job Club at BBELS and from some of my friends who I met in Byron Bay. What kind of work have you been doing in Byron? I worked in different places such as industries, restaurants and in the BBELS school, mainly as a cleaner. I worked in some houses as a painter as well, but it was just a temporary job. The most important one was working for BBELS cleaning the rooms after class time. Byron Bay has so many things that I love. The people are special, so friendly and environmentally conscious. In the town you can always feel a positive atmosphere everywhere and it is so peaceful if you are not in the main street where the fun is guaranteed, and the beach is just amazing. The hippie-style makes this town one of the best places that I have visited. First of all, the most important thing is to always speak in English, even when you are speaking with people from your own country. It makes a big difference between improving your English skill a lot or just a little bit. Another important piece of advice is to try to get involved with locals. For example, when I was studying at BBELS I played in a local soccer team and we qualified to the final round of the tournament. It was my best experience there due to the people I met. The Eureka soccer team is a wonderful family. 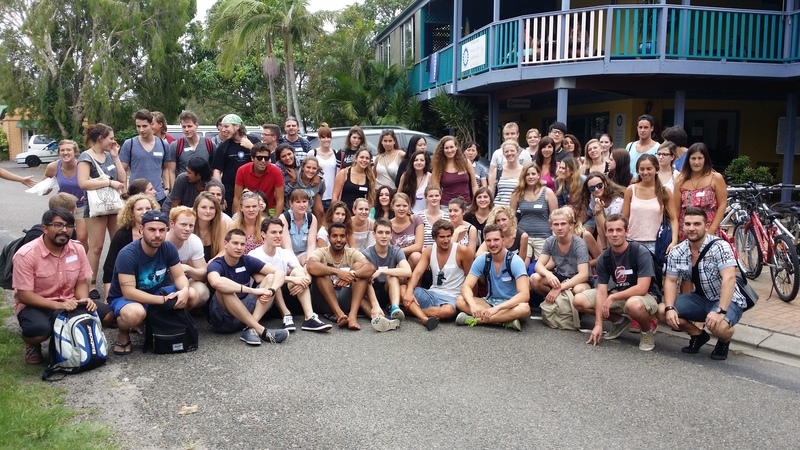 Welcome to Byron Bay English Language School, 2015! Some of our new students for 2015. Good luck everyone. Happy New Year to all of our students. We hope that all of your dreams and ambitions for 2015 will be realised. The school year has started well with over 70 new students arriving from Japan, Brazil, Switzerland, South Korea, Germany, Spain, Italy, Belgium, Portugal, the Czech Republic, Chile, Columbia, the Netherlands, and Saudi Arabia. We have a really diverse international community studying here. One of the greatest experiences our students enjoy while studying at BBELS is making friends and connections with people from all over the world. We have even had a couple of students marry their classmates over the years! In 2015 we continue to offer the Cambridge Exam preparations courses, an IELTS course, courses in General English, as well as our combined courses such as English Plus Surfing, English Plus Diving, English Plus Yoga. There are plenty of study options to choose from so please visit our website to learn more about our courses.